I just read a post by a male who said that V. Stiviano deserved to be punched in the face. He proceeded to call her a prostitute, c-word, and a bunch of other names. What’s with the anger bro? Go for a run or a swim or jump in the ocean, cool off. I don’t like sucker-punching. That’s a coward’s move, and V. Stiviano was sucker-punched. Some people might argue that Mrs. Sterling should have been the one to punch V. Stiviano in the face. The $2 billion (yes that’s BILLION) sale of the Clippers, however, probably makes Mrs. Sterling a little bit too happy to punch anyone. Did I forget to mention that she was sucker-punched by not one, but two guys? Then, a few other guys chased those guys down and beat on them for punching her. One phrase that was ingrained in me while I lived in the Bluegrass state was “It’s not your place.” The random Dominick Diorio and his friend had no business getting involved. It wasn’t their place. Maybe I’m a hypocrite for liking that men who saw Diorio and partner beating up on a female didn’t think “it’s not my place” and chased Diorio and his friend, and then administered a beat down. I’m not in favor of the beat down, but I’m pretty sure that making a citizen’s arrest wasn’t an option. What a crazy night for all involved. I think the actions of Diorio and his friend are pathetic, and the those who support their actions should rethink their stance. Who goes around punching people for something that doesn’t affect them? That being said, I can’t help but notice the blue lace shirt worn by V. Stiviano in the photo she released to the media. If her game was to stay a controversy, that shirt was a great choice. I always wonder from all sides. Were those guys really coming from a random place of hate? Were they paid to punch her by the Sterling family? 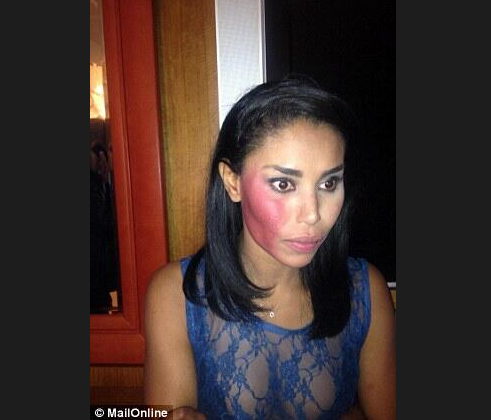 Were they paid to punch her by V. Stiviano so that she could still be a hot topic? What the heck is going on in this world? Did another law get passed that I need to know about, but don’t, because these two guys hit a girl who released a private recording that resulted in the sale of a sports team and fueled talks about racism and freedom of speech and a right to privacy? Should I be reading and writing about President Obama and V. Putin right now? And if I did, would anyone care?